As a manufacturer of trailers and superstructures, Krone wins the prize “Best Logistic Brand 2017“ awarded by the Federal Association of Logistics (Bundesvereinigung Logistik, BVL). During the award-night in the Bertelsmann representation in Berlin, Krone’s Managing Director for Sales and Marketing, Gero Schulze Isfort and the Head of Marketing, Ingo Lübs received the award in front of a wide audience including guests from the world of economics, politics and science. 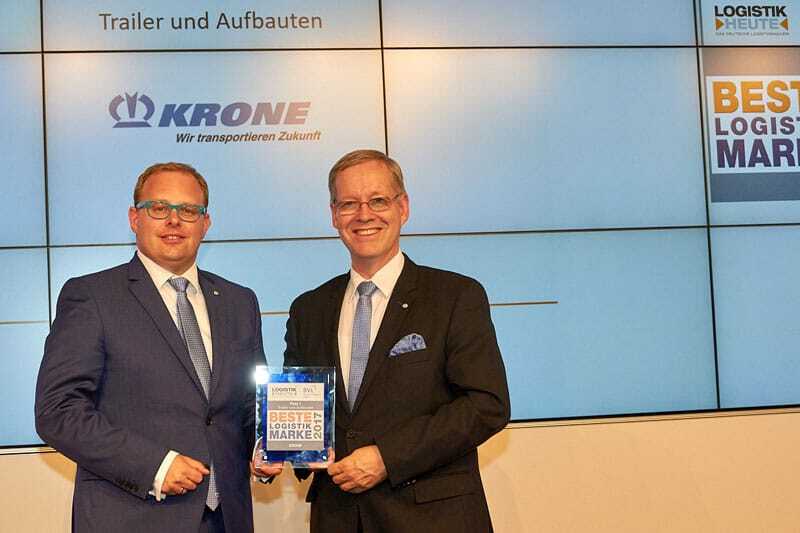 The Krone Company with more than 4000 employees won in the category “Trailers and Superstructures” and came out on top of 19 candidates. The Federal Association of Logistics awarded the prize: Experts in Logistics and Supply Chain Managers in Germany, Austria and Switzerland elected the “Best Logistic Brand 2017” in eleven categories. Previously, an independent committee under Prof. Dr. Christian Kille, logistic expert at University Würzburg-Schweinfurt, nominated 260 brands in eleven categories. 36.000 readers of “LOGISTIK HEUTE“ and 10.000 readers of the digital “LOGLetter“ from the Federal Association of Logistics were asked to participate in the election and supported the success of Krone. “Without compromise we focus on product quality. Our customers expect practice-oriented solutions, which improve the efficiency of their logistics. And we deliver this. Thus, we are glad that the professional audience also evaluates our trailers as excellent”, remarks Bernard Krone, Executive Partner of Bernard Krone Holding SE & Co. KG, who runs the family business in its fourth generation. The journal “LOGISTIK HEUTE“ publishes all results in a special edition in magazine May 2017.